Simply fill this volcano with baking soda, set it on a table, pour vinegar into the top, and watch it erupt. To show your students what a smoking underwater volcano on the ocean floor would look like, fill the volcano with baking soda and place it in a glass beaker of water. For a fun effect, add colored bath tablets, sold separately. 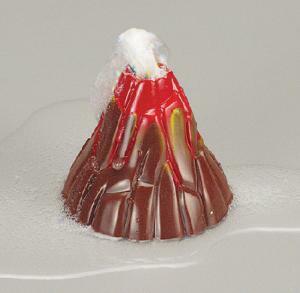 The Pocket Volcano comes with enough baking soda for two eruptions. Caution: WARNING: CHOKING HAZARD - Small parts. Not for children under 3 yrs.